Traveling with pets this holiday season? Does your upcoming travel plans include pets? Whether you’re flying to an exciting destination or hitting the road, these suggestions can make the journey easier for animals and humans alike. 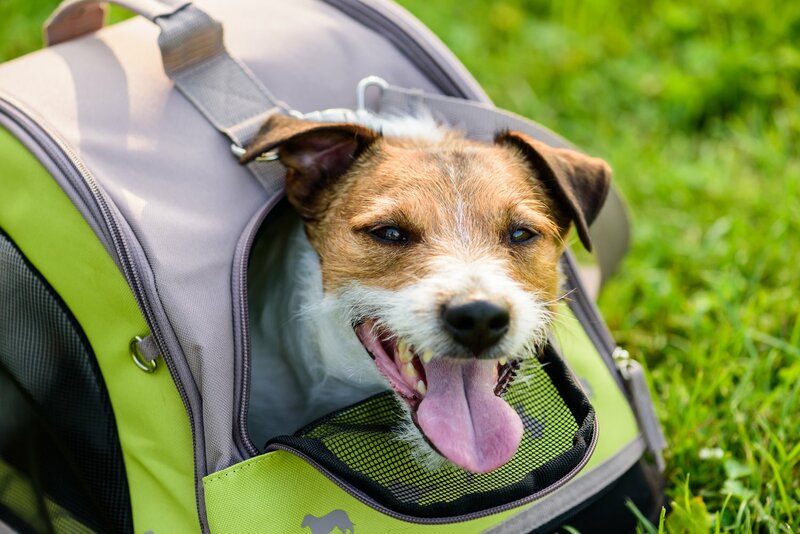 Pack plenty of food and fresh water and a sufficient supply of any medications your pet is taking, as getting refills away from home could be difficult. To alleviate anxiety, bring along pet blankets and toys as reminders of home. Also pack a pet-specific first aid kit, which should include non-stick bandages, adhesive bandages, towels, gauze and your veterinarian’s phone number. Do your research to ensure you’re following rules along the way and at your destination. Check airline policies, as well as hotel and campsite restrictions and accommodations. Travel across state or international borders requires a health certificate. Unbeknownst to many pet parents, dogs and cats who cross state borders are required by the Department of Agriculture to meet certain entry requirements. While every state has different requirements for pets crossing state borders, most states require one of two things, if not both: a pet health certificate, and a certificate stating that your pet is current on vaccinations, such as rabies. Give yourself plenty of time to handle these details. Your veterinarian can be a good resource in learning what to expect. To that end, a check-up is also a good idea before a trip, as vaccinations or preventive medications may be needed before traveling. While seatbelts alone can keep a dog from moving about the cabin of the car, they are not your safest option. To help protect pets in a crash, anchor your pet crate using a seatbelt or other secure means. When flying, opt to keep your pet in the cabin of the plane if possible. Temperatures and air quality in cargo can put a strain on pets. If your animal is too large to fly in the cabin, speak to your veterinarian about what you can do to keep your pet safe and relaxed in-flight. Even the best laid plans can hit snags. Be prepared for the possibility that your pet could become accidentally injured or develop an unexpected illness while traveling, prompting an unplanned trip to an unfamiliar vet. To prepare, keep your veterinarian’s phone number handy and consider taking a copy of health records if your pet suffers from a chronic disease.